Americans have long been fascinated with European views of the United States. The many Chinese commentaries on America, however, have remained largely unavailable to the English reader. 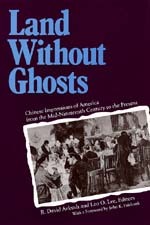 Land without Ghosts presents for the first time selections on America from Chinese writings over the last 150 years. Included are extracts from the travel diaries of nineteenth-century diplomats, a first-hand account of blacks in 1930s Alabama and of the young white Communists working to organize them. R. David Arkush is Professor of History at the University of Iowa. Leo O. Lee is Professor of East Asian Languages and Cultures at the University of California, Los Angeles.